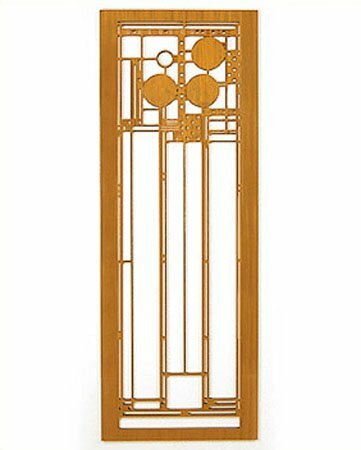 This stunning Frank Lloyd Wright Coonley Playhouse Hardwood Art Screen Wall Panel measures 31.5" x 11.5" x .5" depth and has been precision laser-cut and comes with a cherry veneer finish. Each panel is notched on the back for hanging and includes hanging screw. This design is an adaptation from a section of the colorful art glass window triptych found in the Avery Coonley Playhouse. Made in USA. Adapted from a section of the colorful art glass window triptych found in the Avery Coonley Playhouse. Precision laser-cut with a cherry veneer finish. This Frank Lloyd Wright panel is officially licensed by the Frank Lloyd Wright Foundation. If you have any questions about this product by Lightwave Laser, contact us by completing and submitting the form below. If you are looking for a specif part number, please include it with your message.